Russian cinematics world, big screen or tv, is intriguing to explore. The list of Russian movies from last year alone is full of titles worth to add to your watch list. Watching movies is one of the fun ways to learn the Russian language. It also serves as a window to peek inside Russian culture and tradition. Historical movies are especially educating. However, some beginners would complain about the dialogue in Russian movies. If it’s too fast then it becomes hard to follow. This is where cartoon coming in. Yes! Cartoon. The lightweight television show should not be looked down upon. They are a perfect kind of movies for a beginner language learner. But what are the titles? Is there any Russian cartoon that is popular and fun to watch? The answer is, there are a lot! Here we are going to list Russian cartoon that goes worldwide success so you can find titles that are easily found. Whatever the medium is, YouTube, cables, or Netflix, you can browse through these titles and see what you like. If you have never watched this title, well, first, what century do you live in? Second, not to worry, you’re going to be in for an exciting ride. Masha and The Bear is one of the most popular cartoons created after the millennium. To be exact, the cartoon is created in 2009 by Oleg Kuzovkov. It’s the most watched animated video on YouTube, garnering 3,9 billion views for a single episode alone. Masha follows the story of 6 years old little girl called Masha and her friend, Mishka (literally means bear in Russian). Masha is mischievous, hyperactive, and curious. Well, she’s like typical 6 years olds out there. Miskha is a huge bear with a heart of gold. He serves as a fatherly figure and a friend to Masha. He’s also a retired circus bear, that’s why he’s skilled in juggling and acrobat. If you watch this show, you’ll laugh a lot watching the naughtiness of Masha which often annoys the bear. Masha often creates trouble and it’s the bear’s job to clean her mess. If you want to learn Russian with this cartoon, you must note that Masha character often speaks with grammatical error (since she’s only a child). This legendary animated movie came out to the audience in 1957. This movie is considered the most popular Russian animated movie. It is regularly played at American TV at Christmas. Gibhli studio founder Hayao Miyazaki considers this movie an inspiration when he started creating animation. The story is based on Hans Christian Andersen’s fairy tale with the same title. But the storyline is a bit different and simplified here. Follow the lives and adventure of two young children Kay and Gerda dealing with the magical snow queen. It’s a story about friendship and love wrapped in magic and fantasy. You can easily find this movie on YouTube. 3. Well, Just You Wait! Known as Nu, Pogodi! 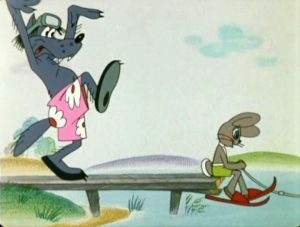 in its native language, this Russian cartoon is often accused as a copycat of American’s Tom and Jerry. But that doesn’t stop it to be popular around the world too. Its theme is indeed similar, a bitter but hilarious feud between two animals who are naturally don’t get along well with each other. If Tom and Jerry is a cat and a mouse, Well, Just You Wait! is a wolf and a hare. Smeshariki is another cute cartoon from Russia. It’s also broadcasted in American TV and TVs in the other 60 countries. The show is translated extensively into 15 languages so if you want to watch its original Russian version, you have to dig the internet a bit harder. Smeshariki is relatively new being created in 2004. In other countries, the cartoon is known as Kikoriki or GoGoRiki. Smeshariki features 9 cute characters you can instantly fall in love with. Follow their life day to day with all their – also cute – problems. It’s a fun cartoon to watch and the language is quite simple. There are more than 200 episodes for you to devour, each has a length of around 6 minutes. Another cartoon coming from the Soviet era. When you first watch this animation, you will notice that the animation work here is surprisingly more advanced in its era. The first episode, Cheburashka and Crocodile Gena, is created in 1971. The main character is an adorable little monkey called Cheburashka. Follow Cheburashka and friends’ adventure in this cute animation movie. The cartoon is very popular in Japan, attracting hundred thousands of viewers all over the country and Cheburashka is then made as a doll for collectibles. Japan is the country of animation, if they think this movie is cool, you can be sure that’s the Japanese know what they’re doing, or more precisely, watching. So those are cartoons in Russia that are popular and goes worldwide success. You can watch for both entertainment and education (improving your Russian). Make sure to focus because the cute character, the hilarious comedy, and the heartwarming storyline could distract you from any attempt of learning. If you want something more difficult, you can go to the next level by watching Russian movies of all time. The more advanced level of Russian Language learning is indulging yourself in some Russian Literature, straight with the original version. Russian classics books are a must read for whoever called themselves bookworm or cultured people.